Zenhaven Mattress Review- What Are The Pros And Cons? 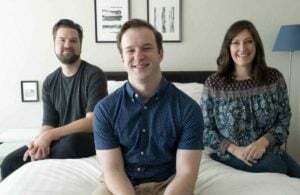 Home » Zenhaven Mattress Review – A Value Latex Mattress? Latex mattresses can have a lot to offer. They are usually hypoallergenic, chemical-free, and they can sleep cool. However, a high price point can often accompany these fine features. While it is not the most affordable mattress on the market, the Zenhaven mattress is priced very low for a latex mattress. It is made by The Saatva Company, producers of the Saatva and Loom & Leaf mattresses. The mattress incorporates Talalay latex, a responsibly sourced material with quite a bit of bounce. I actually reviewed the mattress before, and I was very excited to try it again. Will you sleep cool and clean on this all-natural mattress? Read on for my full review. You are looking for an all-natural mattress. This mattress contains many layers of all-natural Talalay latex. This material is responsibly sourced from rubber trees and actually absorbs CO2 during its production. Also, it is hypoallergenic, toxin-free, and resistant to dust mites. You are a hot sleeper. If you overheat at night, the Zenhaven might be a good choice for you. The latex makes this a breathable mattress and it should keep you cool while you sleep. You are looking for a long-term investment. Talalay latex is a very high-quality, durable material. Because of this, the mattress should stand up to years of use. If you want a mattress to last you for some time, this mattress should work for you. You are a back or stomach sleeper. If you sleep on your back or stomach, you should find the support you need on the Zenhaven. Also, given that this is a flippable mattress, you should be able to find the right side to support you just right. You want a more affordable mattress. While this is a good value for an all-natural latex mattress, it still comes with a higher price point. If you aren’t looking to spend so much, a latex mattress might not be the best choice for you. You are a side sleeper. Even though this mattress has two sides, neither is a very good fit for side sleepers. I did not feel good pressure relief on either side so, if you sleep in this position, you might want to find something softer overall. You don’t like a bouncy mattress. The latex in this mattress has a very bouncy, responsive feel. If you don’t like this feel and prefer to sink into your mattress, you might want to look at a different mattress. The soft cover is knitted with organic cotton. From the Luxury Plush side down, there is first a flame-retardant layer of wool. Next, there is 1.5” layer of Luxury Plush Talalay latex. It is zoned, so the firmness will vary across the surface of the mattress. This is followed by a 3” Talalay latex Plush base layer. Then, there is a 3” Talalay latex Firm base layer. Next, there is a 1.5” layer of Gentle Firm Talalay latex. Finally, there is another flame-retardant flame layer and the same knitted, soft cover. The Zenhaven is flippable. It has a Gentle Firm side and a Luxury Plush side. The Gentle Firm is firmer than the Luxury Plush and has a thinner comforter layer. Both sides of the mattress feature a zoned comfort layer. This means the mattress is more supportive under the heavier parts of your body and more pressure relieving near the shoulders and other areas. The Talalay Latex is all-natural. If you prefer to stay away from chemicals, this mattress could be a great option. Latex mattresses are usually very bouncy, and the Zenhaven is no exception. It is very responsive, making it easy to move around on the mattress. All-natural latex is also one of the more durable materials out there. If you compare this to a foam mattress, the Zenhaven should last much longer. Latex is also a very breathable material. So, the Zenhaven should be a cooler sleeping mattress. How Does This Mattress Compare To The Saatva And Loom & Leaf Mattresses? 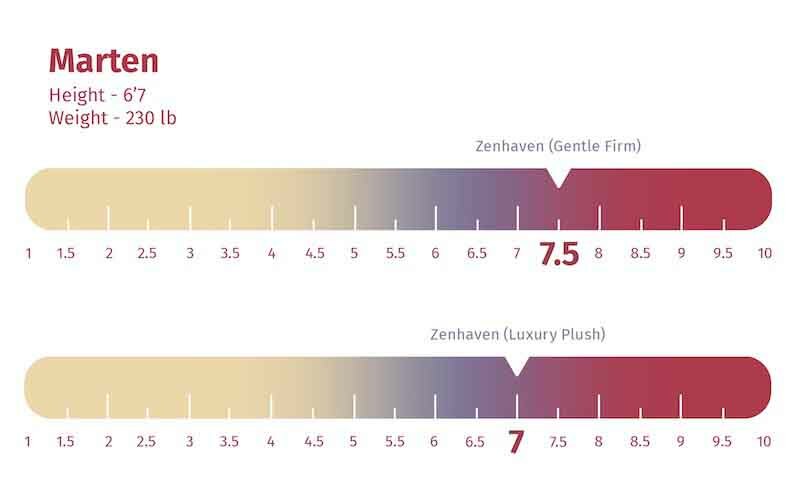 If you are looking at the Zenhaven mattress, you might want to know how it compares to the other mattresses from The Saatva Company. Comparing this mattress the Saatva, the Zenhaven is a latex mattress, while the Saatva is an innerspring mattress with a pillow top. The latex gives the Zenhaven a bouncier foam feel, and the Saatva has that traditional spring, pillow top feel. Also, the mattresses are very close in terms of firmness. The Saatva and the Gentle Firm side of the Zenhaven both feel like a 7/10. 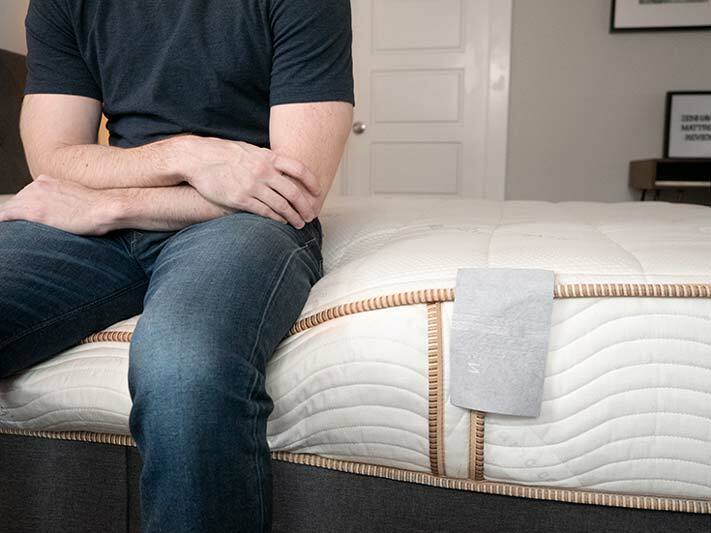 The Loom & Leaf mattress is an all-foam mattress. The mattress has a firmness of 6.5/10, which is pretty much the same as the Luxury Plush side of the Zenhaven. In terms of feel, the Zenhaven has that bouncy foam feel, while the Loom & Leaf has that memory foam feel. The Zenhaven is much more responsive, and you will sink into the Loom & Leaf more. In terms of price, the Zenhaven is going to be more expensive than the Saatva and the Loom & Leaf. It costs quite a lot to naturally source latex, so this is no surprise. With this higher price, you get more durable mattress. The Talalay latex should make the Zenhaven a longer lasting mattress than the Saatva and Loom & Leaf. 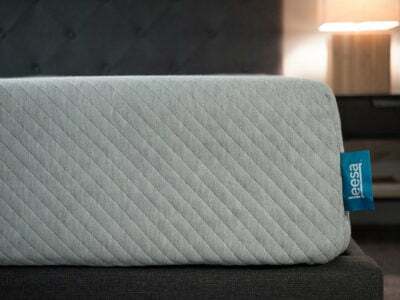 The Zenhaven is a flippable mattress, so it has two firmness options. That being said, they both felt close in terms of firmness. The Gentle Firm side felt like a 7/10 and the Luxury Plush side felt like 6.5/10. On the Gentle Firm side, I felt very good support on my back. My hips don’t sink in too far. On my side, however, I feel some pressure on my shoulders and hips. When I move to my stomach, I feel well supported. On the Luxury Plush side, I feel even better when I lie on my back. My hips sink in just the right amount and the top comfort supports my lumbar area. Again, on my side, I am feeling some pressure on my shoulders and hips. It is less than I felt on the Gentle Firm side, but I think this mattress might be too firm overall for most side sleepers. On my stomach, I feel decently supported, but I think most stomach sleepers will prefer the Gentle Firm side. In terms of feel, both sides have a bouncy foam feel. The latex is very responsive, so it bounces back quickly. This means it should be very easy to move around on the Zenhaven. When it comes to handling motion transfer, latex mattresses don’t perform as well as a memory foam mattress. So, testing out the Zenhaven, I was not surprised that the mattress did not deal with motion transfer particularly well. When I placed a water glass on the mattress and pushed into the surrounding area, the water was disturbed somewhat. Also, when Marten moved around on the other side of the mattress, I did feel his movements on my side of the mattress. As a medium-firm mattress, I didn’t expect the mattress to compress too much when I sat near the edge. Sitting down, I did indeed feel like I could comfortably sit and tie my shoes. However, lying down near the edge, I did get the feeling that I might roll off the mattress. This is worth noting if sleep with a partner or want to use the full surface area of the mattress. The Gentle Firm feels like a 7.5/10, and the Luxury Plush feels like a 7/10. On the Gentle Firm side, I feel very nice overall support when I am on my back. My hips sink in just the right amount. When I move to my side, I feel some pressure on my shoulders and hips. On my stomach, I also feel good overall support. On the Luxury Plush side, I also feel good overall support. I feel less supported than I did on the Gentle Firm side, however. On my side, I am still feeling pressure on my shoulders and hips. When I am on my stomach, I am not getting enough support on this side of the mattress. If you are a heavier back sleeper, both sides could work for you. If you are a heavier side sleeper, I would look for a softer mattress overall. If you a stomach sleeper, I would use the Gentle Firm side. While Marten thought the mattress was a bit firmer than I did, he agreed that the mattress is a good fit for him when he is on his back. Also, like me, he thought the Gentle Firm side was more fit for stomach sleeping. This makes me think that even larger back and stomach sleepers will find good support on the Zenhaven. The Zenhaven is an all-natural latex mattress and should be a great choice for those who want to avoid chemicals and allergens. While it does cost more than many bed-in-a-box mattresses, it is still a very good deal for a latex mattress. This should also be a cooler sleeping mattress. The latex does a good job of dissipating heat, so you shouldn’t sleep hot on the Zenhaven. The latex is also very durable, so this mattress should be a good, long-term investment. It is a flippable mattress, so you have two firmness options. Most back and stomach sleepers should get nice support on the Zenhaven mattress. Zenhaven is an all-natural latex mattress made by the same company as Saatva (innerspring) and Loom & Leaf (memory foam). 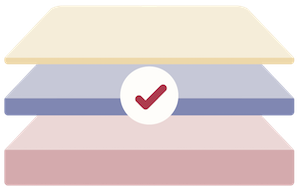 I had a great experience with the mattress, and really enjoyed the all-natural aspect. The mattress is expensive, but for one of this quality I think it's actually a great value. If you are looking for a latex mattress but don’t want to pay exorbitant prices, the Zenhaven could work for you. It isn’t the most affordable mattress but, for a latex mattress, it is a very good deal. Back and stomach sleepers and those worrying about sleeping hot should find what they need on this all-natural mattress. However, side sleepers and those who prefer to sink into their mattress might want to look elsewhere. The Zenhaven comes with a 120-night sleep trial, a 20-year Warranty, as well as free shipping and in-home setup. Financing is also available. Curious—why do you recommend this bed in the comments for side sleepers when there are several instances in the article stating that it’s NOT good for side sleeper? I’m considering returning mine…it’s not necessarily too firm on the soft side, more like the cover doesn’t give enough to relieve the pressure under shoulders and hips. The soft side of the Zenhaven is pretty good for side sleepers, but there are some better options out there if you just sleep on you side. 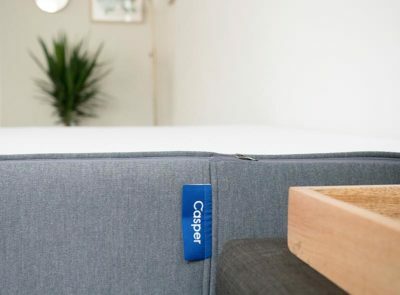 HI, We tested the Casper wave and really liked it but this seems like a better value. how do you think they compare? They are quite different. Zenhaven is going to be very bouncy and probably feel slightly firmer overall. If you liked the Wave, I would just get that. Joe! Please help. I am a female 59 year old and weigh 153 and 5’8. Side sleeper, but always wake up 3 or 4 times a night due to hip pain/bursitis. Money is not the problem, its finding the right latex and ILD. Our old bed is memory foam and 4 years old. I hate it and my back seems to continuously get worse. Please direct me where to go. I will be so grateful. Are you sure you want a latex mattress? For people willing to spend ~$2K for a latex mattress, I think the Zenhaven’s main competition includes zip-in component systems (Flobeds, Sleep EZ, etc.) The Zenhaven offers the convenience of a “finished” product, and they will remove your old mattress. So, delivery and set up is a little more convenient than the zip-in systems. The trade-off is that with the Zenhaven, you only get 2 chances to get it right (or 3, if you include the free 1.5″ topper that they send to some customers on request). Zip-in component systems offer many more possible combinations of soft-medium-firm. If your weight (or BMI) is about average, and if you usually sleep in the same position, then Zenhaven may well have you covered with one side or the other. It seems to be a well made product, fairly priced, with good customer service. However, if you are overweight or have spine/joint problems, then you might be better off with a product tailored specifically for your requirements. I just purchased a Zenhaven after no success with the innersprings not providing adequate support. After 1 night on the Zenhaven, I felt it was too hard, even on the luxury plush side, for a side sleeper. Do they soften up? Without the hot feel of foam, what other options are there for good support but cushy enough for side sleeper? It should soften up a little bit but not too much. You can try the Purple. It is softer yet supportive at the same time. It won’t sleep hot either. Got the Zenhaven and found my shoulders sore when side sleeping, didn’t seem to have enough pressure relief due to no pillow top. also woke up with sore back. Wasn’t sure what else to get, but I got the feeling i’d like to go back to inner spring. so they swapped for the mid-firm range saatva coil spring mattress just now. $99 bucks for return or swap but beats being stuck with a $2500 mattress I’m not happy with. Also the spring mattress is $1000 less so bonus. will see how that goes and write up a review on that page. Saatva as a company and their delivery people were great to deal with every step of the way! Joe, Do you think this Zenhaven Mattress would be good for a Murphy Bed set up? You should know that the mattress is extremely heavy and very floppy as well (as are other natural latex mattresses). It could work but it’s probably not the best type of mattress for that kind of set up. I am 5’9″, weigh 212, 60 years old with a little minor scoliosis. I’m a side sleeper who switches sides a lot. Will the Zenhaven work for someone my weight? I meant to say, “but (Nectar) is too firm, ” not “because it is too firm.” Trying to find a softer but supportive alternative, and something with a little bounce. Now looking at latex. Thanks for responding back. Hi Joe, I’m currently sleepless on a Nectar mattress because it is too firm for my liking. My doctor recommended a Posh & Lavish latex mattress, but it’s pricey. I also looked at Nest Bedding’s Q3 all latex mattress. I like something that’s all natural. What’s your opinion on P&L and Nest compared to Zenhaven? Thanks. I’m not familiar with the Posh & Lavish unfortunately. I actually think the Zenhaven soft side is softer than the Nectar. Firmness is subjective, but I do believe most will agree. Don’t think there’s anywhere you can lay on one. You’ll have to make a leap of faith. If you are a side sleeper, you might like the soft side of the Zenhaven. Can you comment on the softness of the softer side of a Zenhaven to the softest option for Spindle? I do not want support but I can’t sleep on a firm mattress – just too uncomfortable. They’re actually about the same. Not enough difference to say one is definitely softer than the other. I’m really worried about smell. Please comment in detail about the smell of the Zenhaven mattress. Thanks. Hi Joe – thanks for all your great reviews! I was curious about Brentwood Home’s “Mirador”. Have you tried it out yet? I’m wondering what the layer of coils would add to feel of the mattress. I’ve narrowed my search down to that, the “Botanical Bliss” and the “Zen Haven”. We will be reviewing that one pretty soon! You have not reviewed Sleep on Latex, why not? Hi Douglas – so many mattresses, so little time! It’s on the list for the future. Hi Jennie – latex can be natural or synthetic, and both can have a variety of other things mixed in them. I’d check with each company for the exact materials used to make sure it won’t adversely effect you. Looking at Zenhaven and Botanical Bliss (9″). Saatva appears to have better warranty covering contouring deeper than 3/4″ but wonder if the dual sided construction makes sense durability wise. Is it best to have firmest layers on bottom both for support and durability? Is Botanical Bliss 9″ thick enough … trying to cut cost. And is a warranty that only covers contouring deeper than 1.5″ adequate? Also do you know anything about Northwest Bedding’s “100% natural organic latex” mattresses? Thanks! I am considering moving from a regular Serta king mattress/foundation to a ZenHaven mattress, can you comment on whether or not I need a new foundation. Seems to me that the foundation I have, which is split and obviously has centre support should be fine… it is 15 years old but I fail to see how they would wear?? Hi Bill – as long as it’s still providing good support and is stable, should be fine to keep the old foundation. 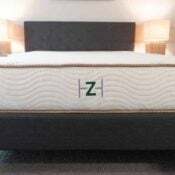 Do u have a rating for the zen haven mattress ? Hi Elizabey – the natural mattresses I’ve reviewed include Zenhaven, Plushbeds, and Spindle. I wouldn’t consider any mattress “toxic”, but the reality is that almost all include chemicals if they have foam in them (which is the reason for the appeal to some of natural latex). I’ve narrowed my search down to Zenhaven and Plushbeds (Botanical Bliss). Which would you recommend? Hi Stacy! Tough one, both great options and similar propositions – I don’t know if I have a good answer for you! You mentioned reviewing Spindle, Zenhaven and Plushbeds which happened to be the 3 I have narrowed my search. May I ask which bed you sleep on and why that choice? I switch mattresses out all the time, so I don’t just sleep on one. The differences in these mattresses are subtle. Zenhaven is a personal favorite, but others may disagree. Joe Auer, you mentioned reviewing Spindle, Zenhaven and Plushbeds which happened to be the 3 I have narrowed my search. May I ask which bed you sleep on and why that choice? We have been sleeping on a traditional mattress with a pillow top that is 10 years old. We need to buy a new Queen size mattress. My wife is 140 lbs 5’4″and i am 210 lbs and 5’9″. I bought a Brooklyn Bed twin for our guest room and we both have been trying it since neither one of us has slept on a Latex or foam mattress before. IMy wife likes it and I also feel comfortable in it but it only has been a few weeks. I am interested in L & L and also in Zenhaven. I think i would like the sink-in feeling of foam because i remember how I felt the first time i slept on our pillow-top mattress. It was so soft and hugging. So I think i would like L & L but i am not sure. My question is this. Since both mattresses are made by SAATVA, should I buy the L & L first and try it? ($1,000 dollars cheaper) and if i don’t like it then exchange it for Zenhaven? I’d go with the one you think you’ll like best first – note that they will reimburse you for the cost of the mattress if you return it, but they do not reimburse shipping (~$100 I believe). I know you have reviewed the Plushbeds Botanical Bliss and this Zenhaven. They both seem similar being 100% natural latex. The BB is currently a bit cheaper and ships (not full service) for free so there is no risk to try. The ZH has the 5 zones in the top latex layer for different amounts of support in different areas and I love that you can flip it for different firmness levels. But haven’t tried both, can you give any comparison between the two? Thank you. Joe: could you do me a favor and elaborate on the “latex feel” that is often mentioned in latex mattress reviews? I know the basic differences (not stuck like foam/not on top like springs)…but I’ve never really read a description of the feeling of latex that helps me truly visualize the feeling. My wife and I had a Loom & Leaf (too hot), and now have a Saatva Lux Firm which we’re on the fence about. I think I’ve all but decided to return the Saatva for the Zenhaven but I’ve never had an opportunity to actually lay on a latex mattress. My only fear is not liking this “latex feel” that everyone speaks of. Could you descriptively explain the difference in feel in a way that might help someone like me envision it? Many of the words used (bouncy for example) sound good but bad at the same time, if you know what I mean. I prefer to not be bouncy when sleeping 🙂 When sleeping, how does the “feel” and comfort differ from other mattresses? Thanks!! Hi Dan – if you’re not moving, it’s going to feel quite similar to a memory foam mattress. When moving around is when you’ll notice the big difference, that’s when you’ll notice the “bounce”. I’ve had the bed and mattress since 11/6/2016 and I like it very much. I’m retired and I hate to get up in the morning and usually roll over for an extra half hour. I had a disaster with a Queen Dual iLE Sleep Number bed and after using the settings from 20 psi to 55 psi. I gave up. The sleep IQ, I think, is a sham. You can reset the number of hours you want to sleep to get a better sleep IQ and who wants to be a slave to something that you can change at will. At the age nearing 79 in Feb, I think the Zenhaven will be my bed for ever. So Far So Good. Check out my innerspring mattress picks if you’re heading towards that type! we have had a zenhaven for about 2 weeks now, on the soft side. Pros, very soft and comfy, easier to get up and out of than a memory foam. However, we are side sleepers, and still find turning over onto our sides a challenge, something I’ve never experienced on our traditional mattress. Also finding our back/shoulders stiff. We just turned it over this morning to the gentle firm side, hoping this will make movement on the bed easier. If our backs don’t feel better in 2 weeks, will have to return. Really want to love this mattress…We are a 55 year old couple, one of us weighs about 145 lbs, the other 170, both around 5’11. 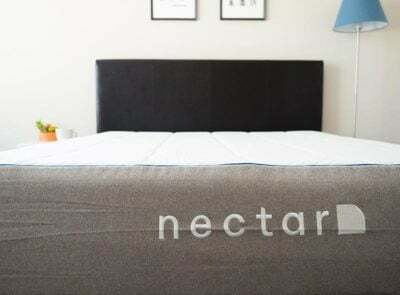 We recently went from a pure nature bliss blended talalay latex ‘nature’ queen mattress, which we found to be a little too firm after a couple of years use, to a king winkbed and after two months find it’s also just a little too firm also. I’m looking for similar support but more comfort/plushness and considering going back to latex again. The Brentwood Mirador vs Zenhaven keep popping to the top of my list. 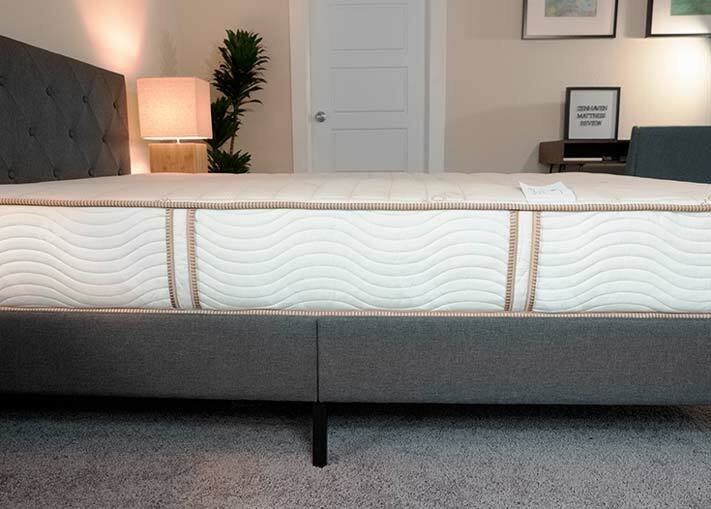 The only other one being considered is the Brentwood Oceano, which is kind of similar to the Winkbed we already have, but maybe a little more plush/comfortable. I’m 220lbs and the boss is 125lbs, and we sleep in all positons….any recommendations, just roll the dice with the Zen? I’ve had many different types of mattresses, Tempur Pedic, Traditional Box Spring, etc and have not found one that satisfies. I HATED the Tempur Pedic-Just too HOT. Although all of these matresses have a 10 Yr Warranty, within a few years, I get divets in the bed. My husband and I are average size and it is very frustrating to spend so much on a mattress that doesn’t last very long. Do you have any suggestions? I purchased the L&L queen mattress six months ago. From the moment I slept on it…I felt like I was burning up. Even sleeping with AC on in my bedroom and tencel sheets I woke up hot in middle of the night. I don’t understand how that’s possible given their claim of medical grade burn material beneath the cover. Oh well. Then there was the pain. I am a side sleeper. Never move side sleeper. Every day a pain in my shoulder and neck that I never had before. L&L extended return period so I could “break it in”. The bed began to feel saggy but still not adjusting to my hips or shoulder. So I just called and asked to swap with the Zen Haven. I slept on a Latex bed for 10 years before L&L one of those latex top – foam bottom to make the bed cheaper. I am going all in by paying more to find that bed I can finally sleep on. Hoping it will be the ZH and will report back after delivery. You have to love a company that lets you return a bed. I would never buy a bed without that option. Thanks for all the great info here. Hi Scott – yes the return policy trend in this industry is great, so glad you’re not stuck with one you don’t like! Zenhaven will definitely sleep cooler than L&L, hopefully it will work well on the pressure points for you also. Do you have any reviews of the DreamFoam Bedding mattresses? I do not yet, but hopefully coming soon! Hi Joe, I have a Saatva Firm Innerspring, we loved it for the first 5-6 months but now it feels like its sagging too much, i sink in when I used to sleep feeling like I was floating on top, this zenhaven sounds like a better choice. But since I chose the 8 (firm) model and thought it would be suitable for my needs. But now I think it’s too soft. I am planning to replace the Saatva I bought less than 1 year ago, due to it sinking in. Not sure if I can trust the Zenhaven to be any more firm. Do you think the Zenhaven on the firm side will be firmer than my Saatva innerspring firm model? Hi Casey – it will be a pretty different feel of course, but I think the firmness (in my subjective opinion) is about the same. Thanks for your insights. Have you reviewed any of the Brentwood latex mattresses? I will be releasing some mini-reviews on those this week, keep an eye out! Hi Joe, thanks for the review. At Sleepy’s. my wife & I tested TEMPUR-CLOUD SUPREME MATTRESS, TEMPUR-CLOUD ELITE, as well as a Zuzu Latex bed. She liked the softness/hugging of the SUPREME, found the Zuzu to firm/hard. She thought the ELITE was too soft, or maybe the memory foam felt more dead compared to the SUPREME. Can’t explain it well, but she preferred the SUPREME, which is #3 on the scale vs #1 for the ELITE. 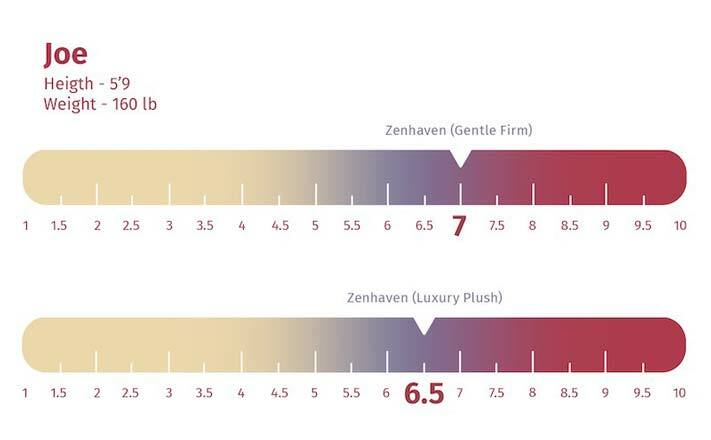 Scales being what TEMPUR puts on the beds to allows customers to visually compare softness. I will note when we tested me getting out of bed with the latex Zuzu, she was fine with the level of motion that transferred. She sleeps on an air mattress now for it’s softness, until we get a bed that has less partner disturbance. So I have concluded memory form or latex will be better than my current Serta Perfect Sleeper which is spring/pillowtop in terms of softness and motion transfer. I’m worried that dead material like memory foam might kill our love life. I will also add my wife is curvy, so I think relieving pressure on her hips is important. She also gets minor neck pain. Hi Joe. My husband and I are looking at buying our first latex mattress and came across the Zenhaven beds. Have seen the Prana beds and loved the feel but the reviews are not very good over a period of time. We are in our late sixties and both have back issues. I had surgery for scoliosis and have 14 inch rods in my back. We are not heavy people. I like a softer mattress now. Our current Temperpedic is too hard and way too hot. Will the Zenhaven last a long time without sagging? What do you think of the Prana bed? Hi Nancy – at this point, Zenhaven is a very new mattress, so I (or anyone else) can’t speak to the durability with certainty. However, I think the materials used in Zenhaven are very high quality, and it is made by Saatva, which has a pretty good track record with their other mattresses. I have owned Saatva products for years. My last purchase was a Saatva innerspring mattress from almost a year ago for my son but the original queen Saatva is almost 5 years old now. It serves me very well but as I grow older, I have developed some respiratory conditions. Although my Saatva is a relatively “green” product, and although I attribute none of my health issues to what just might be the best value for an innerspring mattress in my great state of Texas (which means if it is the best for Texas it is the best for any state!! ), I am changing so much of my life. Where is any toxicity in my life? Well, the husband is now gone! My air conditioning filters are regularly cleaned, All household cleaning products are strictly organic. My sheets are organic on my new…..ZENHAVEN BY SAATVA!! I ordered their new product 3 months ago and although there was no real need to switch from my Saatva innerspring, $1899 for a 100% pure latex mattress is thousands less that what is offered out there in JungleLand aka mattress stores. Saatva adds nothing to this mattress to compromise the integrity of their selling it. No block layer of poly foam. 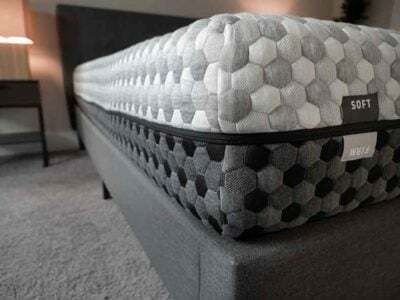 No chemical additives whatsoever…just pure Talalay latex and if you don’t know what Talalay latex is, learn what it is and I will teach you right now. Ready? it is the best latex money can buy. American. Pure. Bliss. To everyone thinking of buying a mattress, you have two choices. First choice, waste your time and get spinned in mattress stores, then go to your pharmacy before going home for anti nausea pills or the second choice. Do what I did 5 years ago and go to Saatva online and buy one of their products. Factory hand made and FRESH, FRESH, FRESH. For me, I am so mattress educated and I have lived so long to buy their latex Zenhaven. You can’t go wrong. You will only go healthy. Hi CB! Zenhaven has a classic latex feel – so a lot of spring to it. I ultimately chose the softer side since I’m a side sleeper. I’m reviewing a bunch of mattresses, many include memory foam options, which are great as well – just depends on what you are looking for. Update – I’m still ambivalent about the feel of the Loom & Loaf. It has run a little hot lately (I’m in NYC) and that concerns me. I feel like I’m fighting it – a good night’s sleep one night, trouble falling asleep on it the next. So I’m thinking about latex again, and I just discovered Spindle. That might be more adjustable than Zenhaven, and it’s cheaper. Spoke to someone in the company (not Neal) and he suggested I try the L&L a while longer, so they’re not overselling, for sure. I think I’ll try some all latex mattresses here again. Also, I realized that I don’t like the tufting on the L&L particularly, lying on it. I just don’t want to settle for a mattress I don’t really love. It’s very well made, though, so it’s not them. It’s me! Thanks Joe. This process is harrowing. !! Hi CB! Latex will (almost) always sleep cooler than memory foam, no matter the quality of the mattress. That being said – I’m in NYC as well, and we just wrapped up an INCREDIBLY hot month weather-wise! I’d give it a few more weeks. But if you decide L&L is not for you, I definitely recommend Spindle. Final update! I returned the L&L without a problem and got a Spindle. Took a while to get used to it but now I love it. Best mattress I’ve ever had. I like the feel much better than memory foam- laying on the mattress and not in it, instantly responsive- everything you’ve described in your reviews. I love love love it! BUT I’m waking up warm (around my bottom but not around upper back). I thought the warmth thing would stop if I bought different mattress pad: I’ve tried 4, including an all-cotton one (cotton top, bottom, stuffing). I just can’t deal with the warmth and waking every night, so I think I’m going to try the Zen Haven. When I called tonight, the salesperson extended my trial period by 50 days so I could have more time to make the decision (it’s about $700 more for ZH). I looked at Plush Beds–and it might be great for natural latex–but I don’t know that. I do know that Saatva makes a quality mattress (Loom and Leaf), and the customer service seems really good, too. Hi Joe. I’m currently trying the Loom & Leaf memory foam relaxed firm mattress and I’m ambivalent about it. I had a Scott Jordan latex mattress for years and I really liked it, though I think the ZH is better constructed. I’m tempted to try the Zenhaven if I can’t adjust to the L&L. Would love your thoughts. I have scoliosis so spine support is crucial., and I’m a side sleeper (also over 60). Yikes. Any advice? Hi CB! Zenhaven is a great mattress, similar quality to L&L I think but just a different feel (a lot more bounce). Hard to say if it will be better for you – one thing I’ll say with Loom & Leaf is that it takes a while to “break in”, I’d try it for 3-4 weeks before you decide to switch. If you don’t like it after that point, then Zenhaven could be a good choice, but it depends on what you want! What specifically do you not like about the feel? Hi Joe! Funny, last night was the first night I slept really well on the L&L. It had been too firm (even though I got the relaxed firm model) but it has slowly softened. I do like the substantial feeling of the mattress. As long as my back is supported! They don’t tell you that there’s a breaking in period – I expected a ‘wow’ the first night. The latex appeals to me because I feel like I should buy the best I can and I really liked my previous latex/foam mattress. But the L&L was pretty good last night, and I have a good platform for it that I’d have to toss if I got the whole Zen system. Though I might really love the latex,. Any thoughts about making the decision? If you like Loom & Leaf at this point, I’d stick with it! Latex is great, but an entirely different feel, so there’s a chance you may not like the change. But if L&L disappoints after a few weeks, Zenhaven might be a good option. 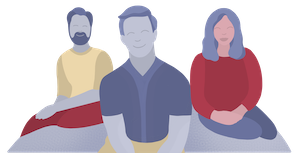 – do you recommend it for side sleepers? – does Latex have any smell? Hi Bernardo! I do think it’s a great option for side sleepers, I’m a side sleeper myself and think it does a good job with pressure relief. Latex does have a bit of smell (initially), but generally less than alternatives (think memory foam). I’ve slept very well on a mattress at Hampton Inn in Chicago…Wondering if the Zenhaven will be a comfy. I can no longer sleep on my old Tempurpedic… Wake several times a night in excruciating hip/leg pains. It will be a pretty different feel than Tempurpedic, but generally I think it’s quite comfy. I recently was having hip/lower back pain. Turned out to be tight hip flexors. I was buying all types of mattresses thinking it was my bed. So please check out some videos/articles online about hip flexor exercises! I’ve tried purple, Alexander Hybrid, TempurPedic Contour Elite, and now I’m on the Zen Heaven. I’ve decided to return the tempurpedic and keep the Zen Heaven. Looking back I think I may have given the Spindle a go if I had known of them a few weeks ago.